Since our Canon 5D World is just starting out, there's not a lot of activity in the forum. If you have a question about your 5D or 5D Mark II, then ask away. But there are other communities on the Web that already have great information from its members. 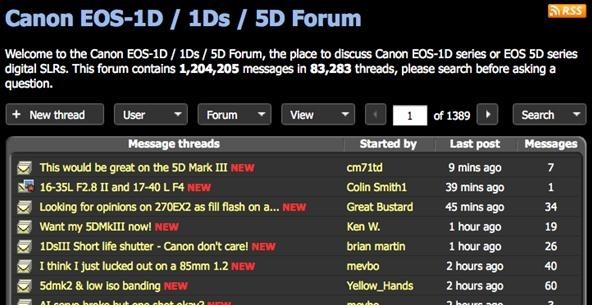 Hopefully, the Canon 5D World forum will be just as helpful to everyone, but for now, here are some of the best forums on the Internet that can help you with Canon's EOS 5D and 5D Mark II cameras. Surprisingly, Canon doesn't have their own forum anywhere, just their Digital Learning Center. DPreview.com is good for getting quick info on upcoming cameras, but they have a lively forum as well, but it's not just for 5Ds. Check out the Canon EOS-1D / 1Ds / 5D Forum and you'll see a lot of activity, mostly for 5D and 5D Mark II, so it's a great place for getting answers. And it's pretty easy to browse and search for specifics. DVinfo.net has a great forum called Canon EOS 5D Mk. II for HD, which houses a range of topics from sharpening images in Photoshop to buying aftermarket 5D batteries. There's even some activity for the Magic Lantern software, if that's your thing. It's not surprise that there's a place on Flickr for the 5D line. 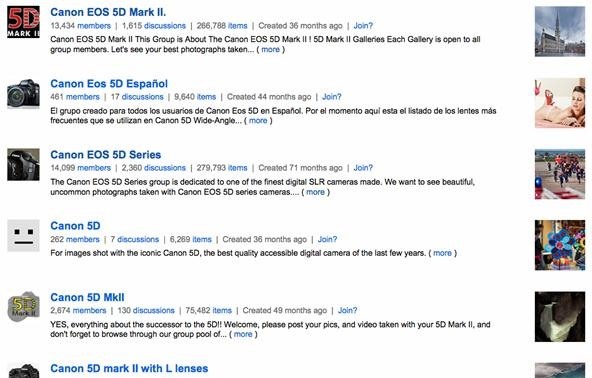 Canon's 5D Mark II is ranked number one out of the 200+ Canon models on Flickr, and aside from just looking at all of the wonderful 5D and 5D Mark II photographs, there's a few groups were you can ask, answer and review questions and comments in the discussions. Check out the Canon EOS 5D Mark II and Canon EOS 5D Series groups for the most activity. Photo.net doesn't have a dedicated 5D or 5D Mark II forum, but you can browse their Canon EOS Forum for information on your camera's body, lenses, Speedlites, and more. It's kind of a hard place to navigate, but if you're there, chances are you have a specific question, so just use the search tool to find it. Planet5D is a pretty good place to get information about anything related to DSLR photography, but one of the finer aspects is its Canon 5D Mark II sub-forum. Vimeo isn't just a great video hosting site, but a great resource for those more interested in the video aspect of their digital cameras. If you've got a footage issue or editing problem, it's probably answered somewhere in their Cameras and Editing Forum. Just search for "5D" and you're golden. Plus, they've got some great groups for 5D videos. If you know of any more places to get help on the Canon EOS 5D or 5D Mark II DSLRs, list them in the comments below. Thanks for including planet5D! We do feel we're the 'best HDSLR site on the planet' - our forums don't have as many posts as some of the others - but I guarantee we've got the nicest bunch of folks - no trolls on planet5D forums! No problem. Good to know there's no trolls. I actually found some help there when researching the differences between 50mm lenses. Great responses from the members.